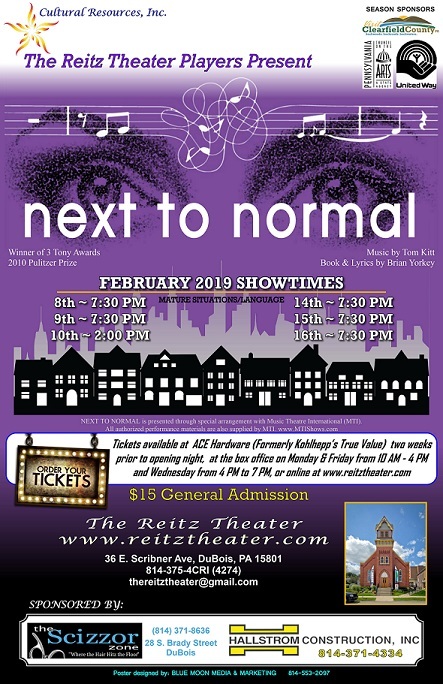 DUBOIS – The Reitz Theater is presenting Next to Normal. The show dates are Feb. 8, 9, 14, 15 and 16 at 7:30 p.m., and Feb. 10 at 2 p.m.
Sign language interpretation will be provided on Feb. 9 by Jenny Gordon. This show contains mature language and situations. Next to Normal is being sponsored by The Scizzor Zone and Hallstrom Construction. The Reitz Theater’s first production of 2019 could change the way you feel about musicals, mental health and life itself. Jason Valentine directs Next to Normal, the acclaimed rock musical with music by Tom Kitts and book and lyrics by Brian Yorkey. With a cast of only six, the show is both dynamic and complex. The Goodman’s seem like a perfect family. The only problem is that sometimes mother Diana is, well, a little too happy. Her husband Dan worries all the time. Her daughter Natalie seems awfully intent on getting that scholarship to Yale, so she can leave home and her son Gabe is another story entirely. A musical about the toll of mental illness on a family might seem odd, but Next to Normal turned out to be one of Broadway’s biggest hits due to its heartbreaking, humorous and unflinchingly authentic look at a family’s struggle with the effects of bipolar disorder. The original 2009 Broadway production won three Tony awards as well as the 2010 Pulitzer Prize for Drama. It is one of only nine musicals to be honored with the latter. It is a musical that is certain to entertain both veteran and contemporary theater enthusiasts alike. The cast includes Amanda Braunns as Diana Goodman, Jason Valentine as Dan Goodman, Rachel Duke as Natalie, Thomas Hibbert as Gabe, Zachary Coudriet as Henry and Andrew Benson as Dr. Fine/Dr. Madden. The production team also includes Deb Kroft, Misti Bruner and Joe Sensor. A special opening night gala to sample foods from The Gateway Cafe in DuBois will be provided when the box office opens at 6:30 p.m. Feb. 8. Tickets for this show cost $15. Tickets can be purchased online at www.ReitzTheater.com, at Ace Hardware in DuBois or by visiting the Reitz Theater Box Office, which opens one hour prior to each show, and is also open Mondays and Fridays from 10 a.m. – 4 p.m., and Wednesdays from 4 p.m. – 7 p.m. Please call ahead (814-375-4274) to make special arrangements for handicapped seating, including ideal placement for viewing the sign language interpretation during the Feb. 9 performance. The Reitz Theater is located at 36 E. Scribner Ave., in DuBois.